I had the privilege of growing up in a household with two parents who knew how to cook. Not just knew how to cook meaning they could get the basics on the table at dinner time, I mean they were both wizards in the kitchen and still are to this day. Food brought us together and I have so many amazing memories as a child of working side by side both of them. 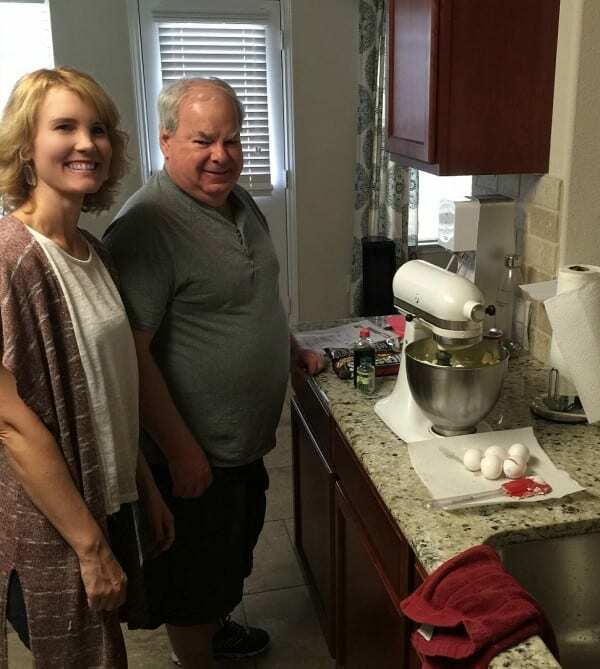 When I was old enough, they let me in the kitchen by myself where I would bake up chocolate chip cookies and anniversary cakes. One time, my brother and I teamed up on an anniversary cake for my parents, substituting baking soda for baking powder. We didn’t have any baking powder and they’re both white, so obviously it was the perfect substitution, right? I’ve since honed my cooking skills and feeding my husband and kids have become one of my favorite things to do. The past few years, my dad has perfected a cheesecake recipe and makes it for us during the holidays and birthdays. His white chocolate lemon cheesecake is one of our favorites and is melt in your mouth good. He’s experimented over the years and has made it with different flavorings and even most recently, made a double layer cheesecake. It was absolutely amazing! 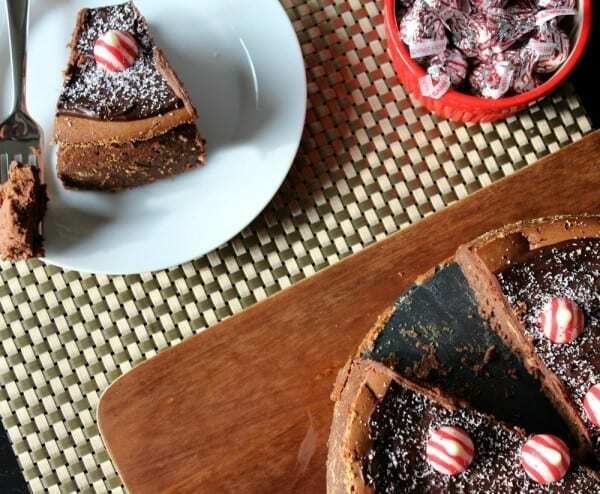 I asked him to join me in the kitchen to create the perfect cheesecake for the Holidays and we came up with this Peppermint Kissed Chocolate Cheesecake. It is so rich, creamy and decadent. Grab a cup of coffee (you’ll need one) to enjoy with a slice. After you indulge in a piece, sit back, relax and enjoy the masterpiece that is cheesecake kissed with Hershey’s Kisses Candy Cane Mint candies. 1. Preheat oven to 325 degrees. Place 2 cups water in a 9/9 pan in oven to humidify the oven. 1. Mix cream cheese and sugar until fluffy. 2. Add eggs one at a time until blended. 3. Add melted Hershey’s Special Dark Chocolate Chips, condensed milk, chopped Hershey’s Kisses Candy Cane Mint candies, vanilla extract, peppermint extract and mix until blended. 4. Pour into spring form pan and bake for 1 hour. (Leave the pan of water on the bottom rack during baking.) Bake until the cheesecake browns on top, puffs up and filling all shakes together when lightly shaken. 5. When the cheesecake is finished baking, turn the oven off and leave the cheesecake in the oven, with the door slightly open, for 45 minutes. Cool completely before putting in refrigerator. 1. After cheesecake is completely cooled, melt the 6 oz. of Hershey’s Special Dark Chocolate Chips and heavy whipping cream in double boiler. When cooled slightly, spread over the top of the cheesecake. 2. Top with Hershey’s Kisses Candy Cane Mint candies, whole. 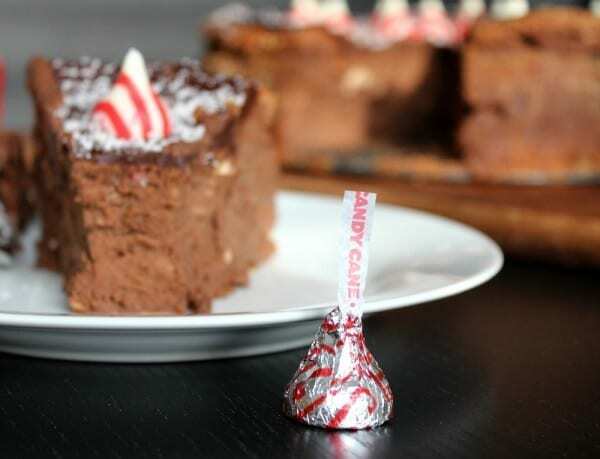 Grate one to two Hershey’s Kisses Candy Cane Mint candies over the top to create “snow”. 3. Remove sides of spring form pan, slice and enjoy! 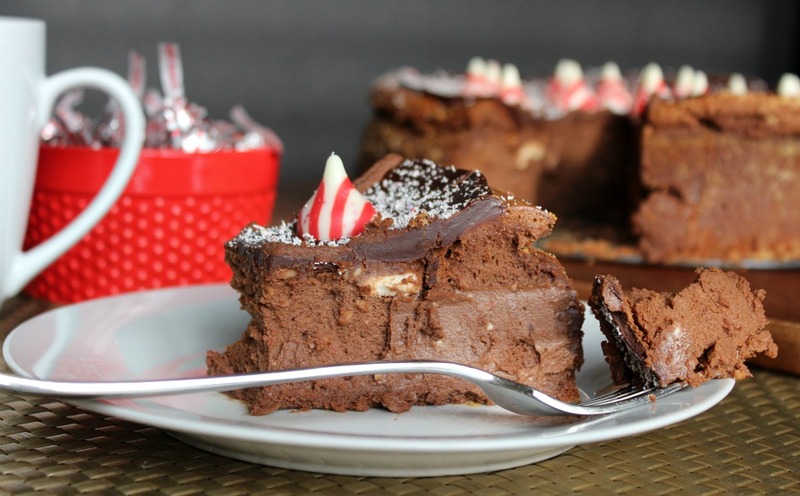 Find more great Holiday recipes from The Hershey Company. This looks delicious. I love chocolate peppermint! This sounds absolutely amazing. Any recipe that combines chocolate and mint is a keeper to me. Thanks for sharing. This cheesecake sounds amazing! 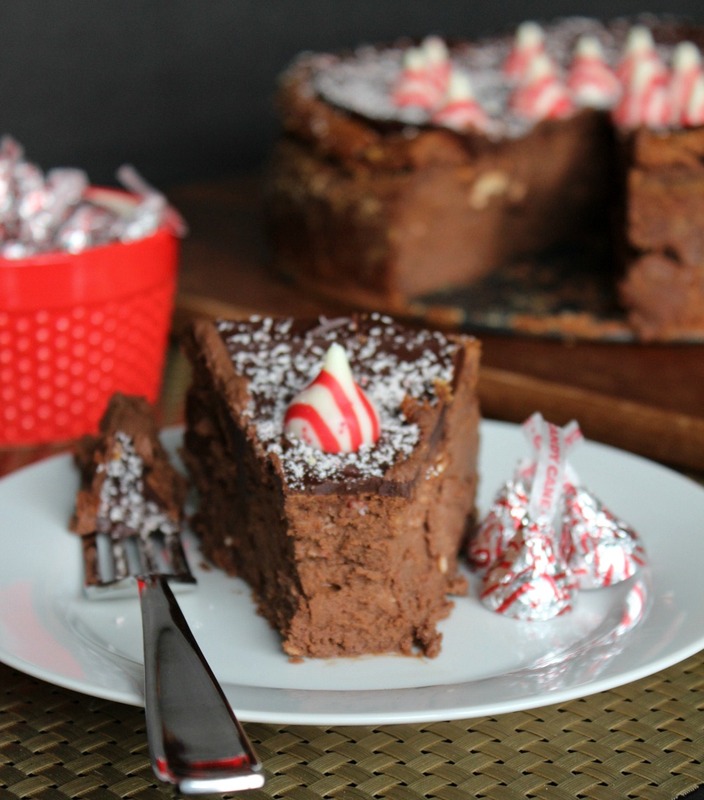 I am so ready for chocolate-peppermint everything! I don’t eat cheesecake (I know, it makes me a freak of nature), but I may have to make an exception for this one. It looks AMAZING! I’m a sucker for chocolate and peppermint. YUM! This looks amazing! I love peppermint flavored dessert this time of year! WOW! This cheesecake looks and sounds just so amazing! 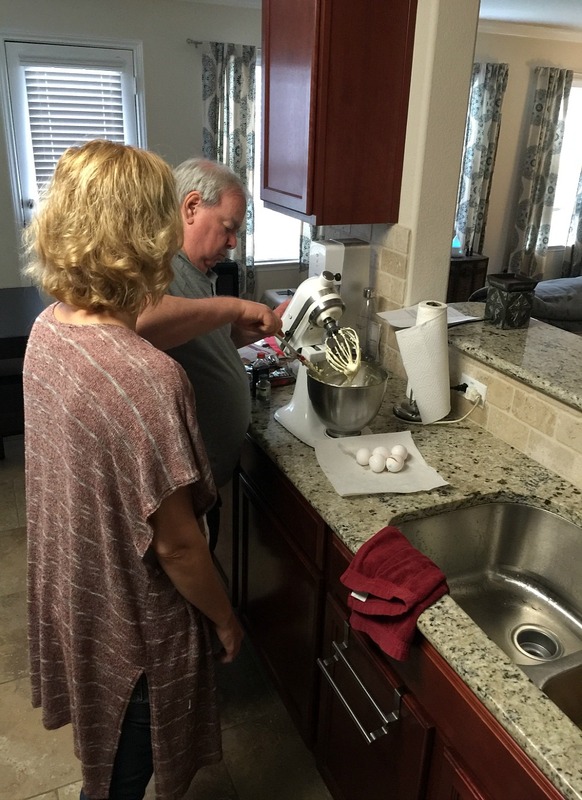 I grew up with both my parents in the kitchen, too, and I cherish those memories! Yum yum yum!!! This looks delish!! 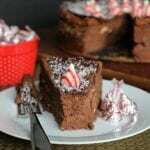 Looks so yummy and great for Christmas!